The Bengal poet Ramprasad wrote exquisite verses to Queen of the Universe, expressing the intense devotion and longing he felt for the Beautiful One. His words express the pure flow of bhakti. Reading them, once can feel the depth of emotion on a pure, visceral level of being. The twelfth chapter of the Chandi Path (more fully called the Devi Mahatmayam or Durga Saptashapti) elucidates the many benefits deriving from the joy of celebrating the Great Goddess in her form of Durga. Holding that Devi in your heart and approaching her with love, she naturally bestows her grace and blessings. Let the Goddess herself be your guide and guru, inviting her into your heart. Jai Kali, Shunya Vasini Devi! Victory to Kali, the Goddess Who Dwells in the Void! 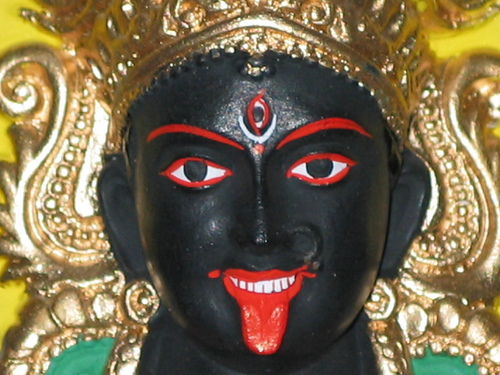 Author Gregory PetersPosted on 22 April 2013 Categories bhakti, tantra, vamamargaTags bhakti, devi, kali, shakta, tantraLeave a comment on Jai Kali, Shunya Vasini Devi! Founded in 1905 by Dr. T. R. Sanjivi in Tinnevelly, South India with “the sole purpose of educating people to culture the light that is latent in one and all,” the Latent Light Culture and its inner order The Holy Order of Krishna teach practical yoga methods based of an esoteric and initiated interpretation of the Bhagavad Gita. The founding material of the organization from the 1920’s is attributed to the mysterious author “Bhikshu”, and contains a strong influence of Thelema and the writings of Aleister Crowley mixed in with the initiated tantrik teachings of the Gita. – From the grade paper of the First Degree of the Holy Order of Krishna. This is the group that originally produced the celebrated tantrik commentary on the Ananda Lahari that was referenced by several of the works of Kenneth Grant in his Typhonian Trilogies. Sadly the organization today seems to shy away from the more esoteric traditions that it was founded on, although the grade papers still show influences of Thelema. Deeper material such as the ritual magic of the Sri Vidya encoded into the Ananda Lahari (the Wave of Bliss, which consists of the first 41 verses of the Soundarya Lahari) is mixed in with a new spiritual interpretation of the Gita. Reflecting on the idea of the usual roles between sadhaka and Devi reversing themselves (see my earlier post), it brought to mind the manifestations of bhava that occur in devotees of the Goddess (often arising from bhakti). This is very much a type of possession, where the Devi experiences through the body and senses of the individual. One form of spontaneous possession is found more frequently in practitioners of tantra and bhakti yoga. This is colloquially called bhava, short for devabhava (a general term for divine state or state of unity with a deity) or bhavavesha (the state of being overwhelmed or possessed by bhava). Bhava combines possession and devotional love, allowing the possessed person to retain consciousness in the midst of the goddess’s power and presence. It shows intense love of a deity, and a person’s humility and willingness to submit to the goddess. April 8, 9 and 10 are important milestones in the tradition of Thelema, marking the grounding of Liber AL vel Legis, the Book of the Law. This book is the first great Western Tantra, ushering in a new era of awakened consciousness for those that choose to consciously step forward into the morning light of the New Aeon. The Tantras however appear and disappear according as they are revealed or withdrawn. Their authority does not depend on the fact that they were published to men on a particular date but on the Siddhi to which they lead; that is, the actual result flowing from them. This result proves the authority of the Tantra even though it were revealed yesterday. The rewards of working with this direct path to realization are manifold and unique to every individual that comes to know and fulfill the True Will. May all sentient beings, boundless as the sky, have Real Peace, Real Freedom and Real Happiness!